The new Perry 28mm ACW ‘Battle in a Box’ package contains a set of easy / fast play rules called Firepower and while I have not got around to painting my lovely 28mm figures yet, I though I would give the rules a spin using my existing Kallistra 12mm ACW armies, which are based on 40mm frontages, just to try things out. The following post gives some early observations from an initial play and gives an overview of the rules. Tap the 'Read More' tab for the rest of this post. I used 3 bases to an infantry regiment, 3 for cavalry (the rules use 2) and 2 for an artillery battery (the rules use 1), which pretty much corresponds to the physical unit frontages given in the rules. I gamed on a 4’ x 3’ space, with units set up close to their respective sides of the board. This is similar to the scenario 1 situation in the book, which also suggests 7 game turns. I used the same forces that come with the boxed package, so 4 infantry regiments, two gun batteries, 1 cavalry regiment and a general were used per side. Though the scenario does not list terrain suggestions, I added to the table a 12” square fenced ploughed field, 1 farm building, two roads, 2 low small hills, and 3 woods - so a fairly typical set-up. Basically during a players turn, a player activates each unit and does something with it, so a unit could fire or move or attempt rally etc, but it can only do one of those things (or none!). 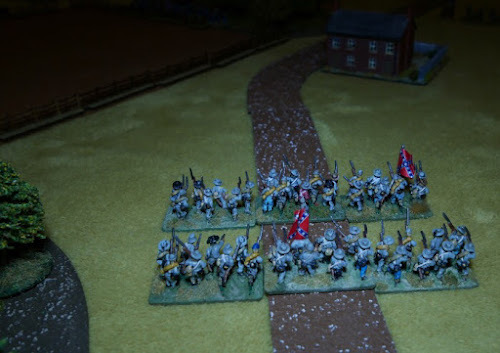 In my game, I spent a couple of turns manoeuvring forwards, then fighting and by turn 6, the Confederates had taken enough hits that they started to voluntarily retreat, so there was enough firepower going on to give me 3 turns of hard fought action out of the 7 possible turns. I think adding more terrain would make for a more interesting game in which the action can be stretched across more turns as this would reduce fields of fire and extra cover would cause some additional hits to be negated as ‘saved’. The following observations come from my initial game with the system. Please note the miniatures used in the following photographs are NOT the 28mm plastics from Perry, which I have yet to paint, but rather are from my collection of 12mm Kallistra ACW. As it turns out, using 12mm figures, the weapon ranges look too long with that scale, though the movement ratings feel right for a 7 turn scenario to get units into action - it is just a visual thing, it will look right with 28mm, which is the important (and intended) thing. Infantry - regiments are eliminated upon getting 9 hits. They tend to be able to survive around two turns of fire and then will likely fail their morale and retreat. If they rally, they can return to combat, but the number of hits they are carrying around stay with them, which means that they are likely to be removed from play if they receive another turn of fire. The condition of the unit and importantly the strength of the enemy will determine whether a unit should fire, move or charge to combat. 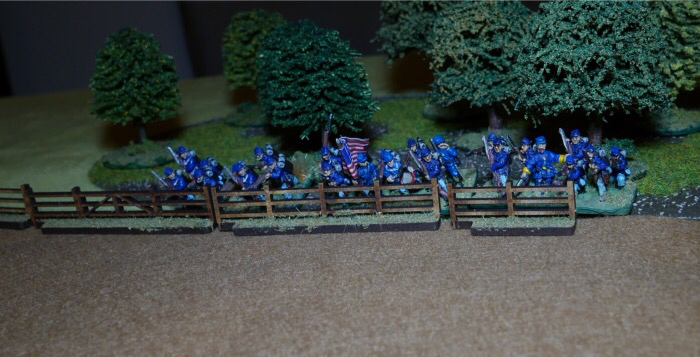 Under the rule suggestions, a 28mm infantry regiment will be formed from three bases. 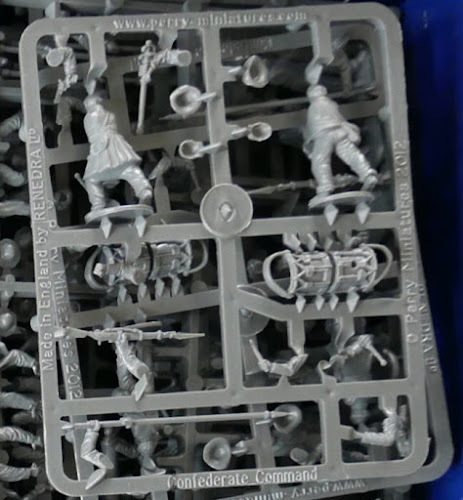 Each base is 45mm wide and has six figures in two ranks of three. So a regiment has a footprint of 135mm wide. 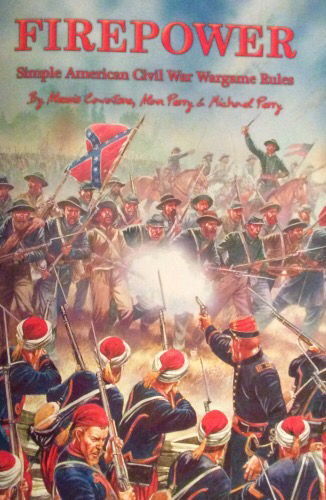 Cavalry - though not frequently used on a typical ACW tabletop, they are given to us in this box set. They are vulnerable, as they are eliminated upon receiving 6 hits. Since units in cover can try and reduce the hits made against them (except when fired on by artillery shot) by rolling 4+ for each hit (a saves system), they are best used to get to defensive positions quickly and then hold those positions. In this regard, the simple cavalry rules encourage a thoughtful and historical use. They can charge, but again the target must be carefully considered as the cavalry are not robust. Pick targets that are already broken or where you can come in from the flank or rear for attack benefits - again, the rules encourage proper cavalry tactics and if the player does not use them in this way (i.e. by instead just treating like fast infantry regiments and making head on attacks) …. they will lose their cavalry pretty quickly. When firing, cavalry have a shorter weapon range (carbines) which is handled using range bands of 3” rather than the 6” used by the infantry. They also have less fire dice. 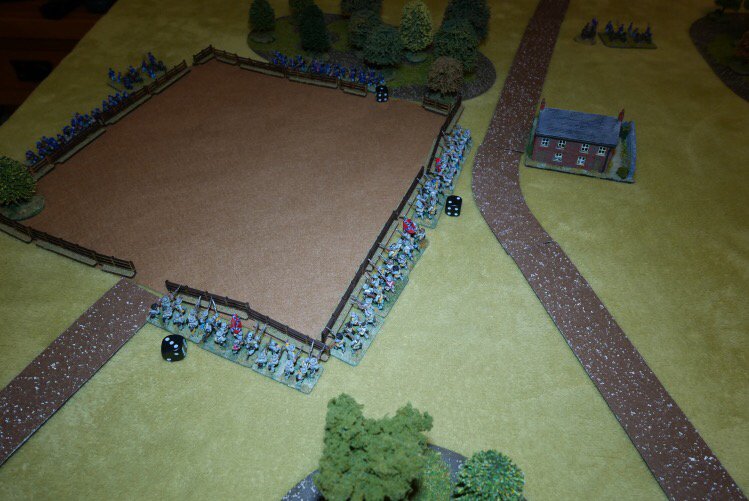 A regiment is formed from two bases, each 60mm wide with 3 mounted models. Artillery - These are quite vulnerable, as they are lost after just 4 hits and because of this, they ideally need to be kept out of musket range (up to 24 inches). However (I missed this rule), they ALWAYS count as though they are in cover, so they can try and save against any hits made against them. In attack, they are not a particularly devastating weapon over the short term and certainly not worth exposing to unnecessary risk. They can fire shot, to which the defender cannot claim defensive terrain or at shorter ranges they can fire more effectively with canister ….. though against canister cover can be claimed. Canister is quite unpredictable as you first roll for how many shots the battery will get (range of 1 to 6) and that can be quite a formidable firepower against exposed troops. This battery has taken 3 hits and will be removed on a 4th. The rules do not have any formation finesse. So cavalry are cavalry, they do not have a mounted / dismounted status and likewise artillery do not have a limbered / unlimbered status - if you want to move artillery, you simply give them a ‘redeploy’ order (though they are slow and cannot move through terrain features). The rally rules say that after a successful rally, the unit can go into any formation - since formations are not used, I have taken this to mean that they can be given any facing, though it might possibly suggest that formations were part of an earlier draft set of rules. Failed morale after receiving fire basically translates into the unit breaking and retreating, they will turn face and retreat (like all movement - randomised distance based on dice rolling). In a subsequent turn they can attempt to rally. However, the rules do not discuss units retreating off the table. The text tends to suggest that a unit retreats to a table edge and then stays there (facing towards the table edge until they make a successful rally (or are seen off with additional casualties) or at least in the absence of a rule to the contrary, that is what I did. In any case these units by this stage are normally pretty knackered and if they do rally, it is likely that they would only be given a defensive role in the hope that they could at least get a volley of fire off before being removed from play. Terrain - the rules do not really say a lot about terrain. They mention streams, hills and farmyards etc in the introduction, which are not provided in the Battle Box, so clearly they are thinking about battlefields that most of us would be creating from our collections, but there is no specific differentiation of terrain type within the main body of the rules. Instead we are given the knowledge that when a unit moves next an obstacle (like fence, house or stream) it ends its movement and then when next ordered to move it ignores the obstacle and for defence, cover can be gained from the likes of a picket fence, a low stone wall, the crest of a hill etc. So during play, the road I laid down is not referred to in the rules and my units that I set up in column on the road are not covered and what to do when moving and reaching the base of a hill is not covered. These are the sort of questions that seasoned gamers will likely ask themselves as they initially explore play. I decided that the spirit of the rules was that everything that we would normally see as giving protection even to the slightest degree would count as cover, even though the handling of cover is purely generic in giving a chance of ‘save’ rolls. But it would not for example cover terrain features such as streams (unless notable steep banks) or open ground hills etc. Likewise I decided that any and all features, including the base of a hill would halt movement - though for practical reasons that was probably a bad call and I would have been better to simply halve the remaining part of the movement allowance when a unit has to start moving uphill - since halting would stop a charge to contact and instead just attract fire before they can get going again. I would be interested on your views about that. Please note that where I mention things that I have questioned or thought about using house rules, this is not a criticism of the rules themselves, which do exactly what they set out to do and are a good set in their own right. Rather it is just me engaging with the rule set and doing what wargamers do ...... tinker - and fast play rules just seem easier to do that with. Something like a road needs a house rule (as they are not covered), such as adding +3 inches if travelling along a road, but then do we need to be in column - the system does not really show formation changes, though you can manage them by simply ensuring that any one base does not exceed its movement (randomly determined ) allowance that turn. 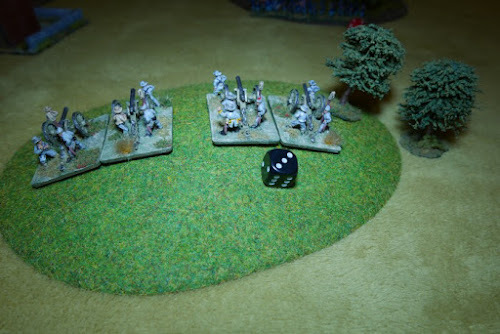 Again a house rule could be that while moving in column, infantry fire is reduced by two thirds (down to 3 dice) or perhaps they should not fire at all. There were some other questions raised as I played such as how to handle a unit wanting simply to fall back. Using the rules, I found myself turning the formation, moving it and then turning it back to face the enemy, ensuring that during all that convoluted movement, a base corner never exceeded its movement limit. A simple house rule allowing units to fall directly backwards at say half movement rate would suit me better, but that is easily implemented. Both sides face off, firing over fences around a ploughed field. The scenarios in the rulebook are based around 7 turns plus a potential random 8th turn. This gives a relatively quick and fun game using the kind of order of battle supplied in the box and one side does look like it will be defeated within this time frame. Because of the save rolls generated by all terrain types including fencing, a defender using a lot of cover can be tough to dig out and an attacker will likely need good superiority in numbers to crack a defence, though this is slightly balanced by the morale checks taken following casualties, which might see a defence abandoned by retreating units that fail their test, taking some certainty and control away from the players (good). Equally, an attacker will not last long out in the open and while after one play it is too early for me to say whether the balance between cover and exposure is where it should be, it is the area that I will be paying most attention to over my next few games. The rules are nicely presented and read well, with quite a lot packed into just a few pages. Once you start play, you will see some things that you may want to deal with that are not in the rules. So for example, the morale tests are all the same, but you might want some veteran or elite units to get a bonus, so that they don't possibly flee when they get 3 casualties etc (I would be bemused to see my Iron Brigade running away from McPherson Ridge with minimal casualties - but then battlefield chaos is exactly what the dice should be giving us). But the basic engine is so robust that all of these sort of things are easily bolted on to give the players something that may better represent their view ACW action and the truth is, these rules were intended to get people into a quick game who do not have an alternative favourite - and that is exactly the job that they do and they do it well. Due to the low complexity of the rules, I find myself comparing them to the Neil Thomas, One Hour Rule set. In that regard, these rules are one level up in detail and flavour because they include morale checks after casualties, charges and leadership effects. In addition, these rules are a little more dynamic because in the action phase units can choose one of several orders. So one unit can fire and then another could charge to take advantage of the havoc caused by the fire, while in the NT rules that can’t happen as movement comes before fire, so taking ground is harder. It will be interesting to take some of the Neil Thomas scenarios (there are 30 of them) and apply the Perry rules - though Neil Thomas scenarios are based upon a 15 turn game, not that I imagine that will matter much. The bottom line is that this rulebook will give a reasonable and fun game that allows the 'everything is in the one box' concept to be realised. I feel there is a significant audience that is looking for simpler systems to give a fun midweek game, perhaps with their kids, these rules will allow that. They will also allow users to easily take the rules to another higher level by the introduction of house rules. without over burdening the system. They seem a solid set to use as a basis for a demo game at a show, where you want to get people playing and get a fast moving game. I got a game in on a 4' x 3' space and I felt that more units could have been added without any problem for the rules or playability. Those who are already playing a favoured or sophisticated system will unlikely see a need to adopt these rules ... but then again, I doubt the rules writers had that audience in mind. I think this has been a good and successful stab at a rule set by the author, particularly in view of the potential customisation of the rules and I can see plenty of people wanting to use them and also perhaps thanks to the Battle in a Box idea, coming to 28mm for the first time. I have been entirely happy with my purchase of the ACW Battle in a Box - Recommended. An interesting summary there. I wonder how the box compares to other "game in a box" operations like the current incarnation of 40K? Indeed, and we already have the likes of Flames at War and Bacus 6mm doing starter sets, though their rules involved more substantial editions, rather than the stand alone fast play ethos that lay behind the Firepower rules. I suspect that in the near future, we will see the number of 'Battle in a box' products rise as manufacturers compete to 'own' periods by being the first to get the fuller range, so perhaps Perry for AWI and Victrix for Punic Wars. Anyone know if the rules are available separately? My understanding is they are not sold separately - however, if enough people contact the Perry's and ask, it may bring about a direct sale option. I can remember discussing the possibility of selling the idea of just such a combined set over a few pints with a couple of friends back in the 80's. We never got much farther so good to see companies doing it. Interesting that the ranges looked long for 12mm troops. At figure scale 24" would be a long but effective range wouldn't it? But the unit frontage would be larger. Anyway conditioning comes into it. I remember having to sit down and convince myself with Volley & Bayonet that the number and size of the figures shouldn't affect ranges and movement since these were based on the footprint of the stand, not the contents. Yes I think that is entirely right, conditioning plays a big part. I am used to seeing my 10mm / 12mm infantry having rifle ranges of perhaps no more than 6 to 12 inches (while they have a frontage of either 3" or 6"), so to suddenly see 24 inch musket ranges on my usual size table felt really strange and everything felt unusually exposed...... at what I would usually feel are safe distances. But they would of course look fine with a bulkier figure (28mm) on the table, which is what they are intended for. This was one of the reasons why my artillery got caught out by musket fire, i hadn't realised that I had put em so near harms way. Hi Jay. I think the most important one to port is that when a unit takes casualties, it takes a morale check (against the number of casualties since the start of play). To fail forces a retreat. I did something similar for my OHW hex conversion, but there I also had a unit that failed gain an additional 2 hits, because in OHW, a battered unit falling back is actually getting an advantage (which is a strange outcome for failed morale), since the hard working attackers now have to move up again instead of firing, though they will take fire and casualties themselves. I found that in OHW elite units were too hard to shift from woods and so attackers were perplexed. Bringing in morale checks can unhinge a defender in OHW that would otherwise hold out to the full 15 casualties and several units could burn themselves out trying to defeat them. I like the look of what you are doing with ECW over on your blog. Interesting report thanks. Its these types of easy rules that got me started in Wargaming way back. Its good to see them still being promoted. yes, depending on ranges and the typical size of a unit in the period / battle being played, the tendency is for ranges to be too long and units to have a frontage too small - and therefore be too maneuverable. For ACW, my rule of thumb is that the frontage and effective range are equal, for musket fire the frontage is twice the effective range. Thanks, I have heard a couple of designers of late comparing effective range with unit frontage, I know Honours of War (Osprey Publishing) does it that way. OHW has been a great shot in the arm and there is a lot of blog creativity around that set. 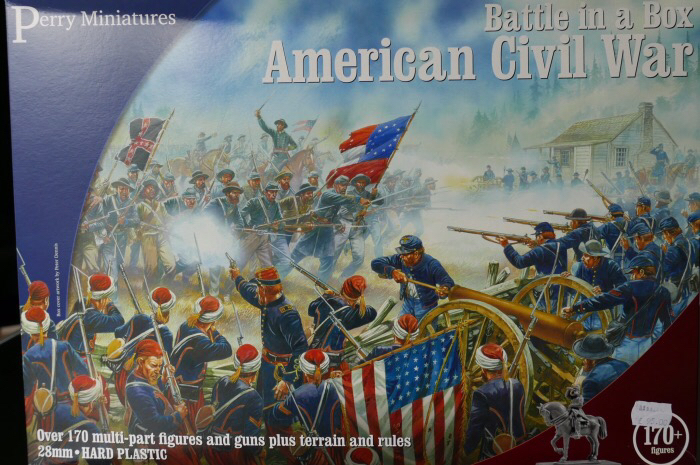 I am using them (plus some house rules) on the table at the moment for an ACW game - which will be the subject of a blog post this Christmas Morning. Just to clear up any confusion, does 'OHW' meant to be 'Honours of War'? In context I can't really see another possiblity, though it would appear to be a simple enough acronym to spell correctly. Oh, right, no doubt it would have been clear if I'd read the post more carefully. However, I can't help wondering if I'm the only one plagued by TMA* syndrome?